It's the time you've all been waiting for! And here I am to announce the winners from our recent Blog Candy Hop. Congratulations! Please visit each Design Team blogs to find out how to claim your prize. A big big thank you to Nikky for providing us all with such fantastic Polkadoodle Products to give away as Blog Candy! Sorry its such a titchy picture, but click on it and you'll see the number in the bottom box! Congratulations! Please email Nikky with 'Blog Hop Winner' in the subject title. And if you are not a winner don't worry as you can take advantage of free postage and packing to anywhere in the world when you spend £5 or more in the Polkadoodle shop! Consider it an early Christmas present to yourself! Just a quick post to let you know that the Blog Hop is now closed and the Design Team are drawing the winners of their candy as I type! Check back here at noon GMT on Tuesday 30 November to see if you are a winner! We will reveal the scrambled word too as not everyone guessed correctly! Happy Friday! In case you missed our post last week the Design Team have a blog hop that is not due to end until this Sunday - so be quick! You really don't want to miss out as there are lots of fantastic bundles of candy available on each of the DT's blogs! Onto this week's challenge! We'd like to say a big warm welcome to the new members of the Design Team! Saskia returns after a summer break, with newbies Colette, Dee and Miria joining us. Watch out for our Guest Design Team who will be joining in with our challenges, starting in the next few weeks for a six month term - Ashley, Audrey and Cheryl. Don't forget - the challenge deadline is Sunday 5 December at 12noon GMT and please remember our 10 challenge rule and no back linking to old posts - entries that do not meet these small requirements will not be considered for our top three. Ruth: I've used the A5 sized template from Paper Boutique Vol 2 - Creative Christmas with a little bit of glitter glue here and there (it's Christmas after all!) plus a little tiny mouse hiding amongst the gifts - he's taken from Back to Nature and I've reduced his size to fit my requirements! Enfys: I took the title of the poem quite literally, for me, Christmas Eve is magical - walking back from church with carols ringing in your ears, and the words of the timeless Christmas story in your head...... I used a navy blue blank card and embossed it with snow, then ran a emery board over the embossing to reveal the white core of the card. 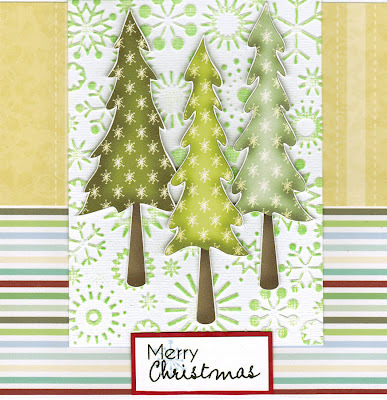 The trees are my favourite Polkadoodles Christmas stamp, I stamped three, then chopped them to different lengths. The star was cut on my cricut, and the snowbanks were hand cut and inked with blue. Brenda - An easel card, yes I'm still addicted to them. I cut the stockings on the Cricut using papers from Jingle Jangle Christmas CD, a computer generated verse from the Clement Moore poem and holly from the Winter section of Sundae of Seasons CD. Saskia - It's great to be back on this Design Team! I still love bright and happy colours... as you can see! I printed out the poem and used papers from the Jingle Jangle cd-rom to create my card and a small stocking-box. Emma Hiya folks, what a lovely theme, I am just getting revved up for Christmas so this was perfect for me. I love the poem and ﻿for me this time I chose to make a stocking wall hanging, something a little bit different. The papers are from the Polkadoodles Jingle Jangle Christmas CD. Claire - I have taken the line from the poem....But a miniature sleigh,and eight tiny reindeer! Using Sundae of Seasons, Paper Boutique - Creative Christmas and Jingle Jangle CD's to create my card with a rubber stamp sentiment thrown in as well. St. Nick has just popped off delivering some pressies! Jenny I've gone with the miniature sleigh too! 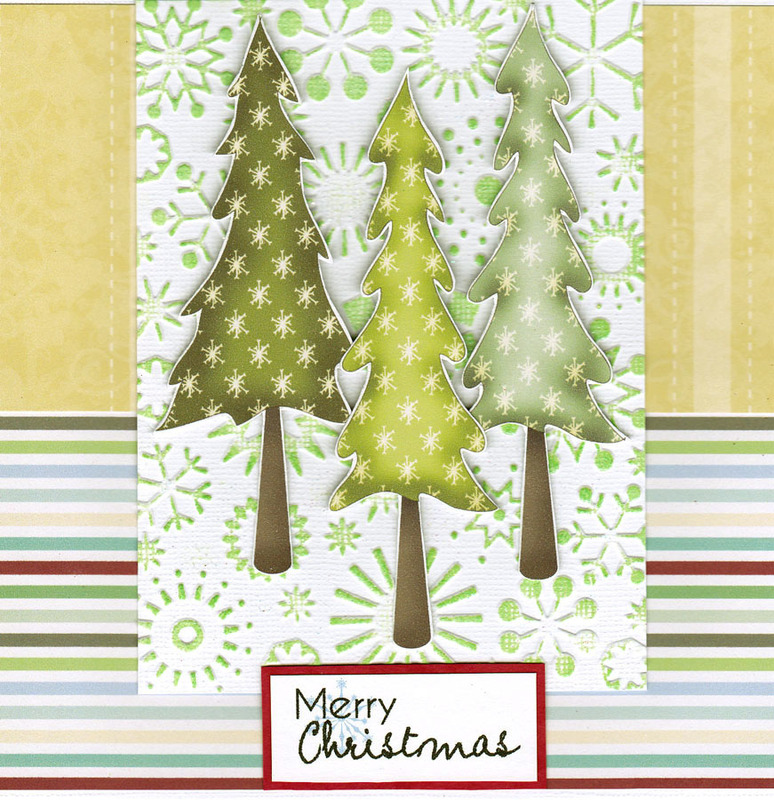 I've used the pre-coloured image from Paper Boutique Creative Christmas and papers from Sundae of Seasons. All that was needed then was some buttons, staples, bling & tons of glitter! Tracie: My card this week uses the gorgeous Fireplace template in A5 from Paper Boutique Vol 2: Creative Christmas as well as a border strip and sentiment from the same CD. I also used HUGE amounts of glitter available here. Colette My first challenge as a design team member, so exciting! I've also used the reindeer part of the poem for inspiration. I've printed a couple of verses from the poem on the front of the card and then when you open it up the next verse is inside, as part of the design, with the reindeer. Papers and graphics are all from the Sundae of Seasons CD. Fliss: My inspiration came from the poem's title as Nikky's gorgeous Prim Christmas Stocking stamp always makes me think of my younger daughter's Christmas stocking which has an angel on and is hung up on Christmas Eve each year. I coloured the image with ProMarkers, cut her out and put her on a Nestabilities mat. 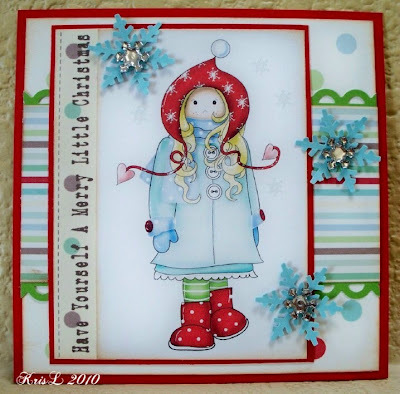 I've used some of the gorgeous plaid papers from the Sundae of Seasons CD and added holly and a greeting from the Christmas Doodles stamp set. Tracy :- I have decided to use the Reindeers in the poem for my creation. My paper is from Sundae Of Seasons, The snowflake stamp I used around the border and my greeting is from the Crimbo Doodles stamp set and this is at a reduced price at the moment, and my main image is from the stamp doodle range this too has been reduced in price and I coloured it with Aquamarkers. Dee: Do you leave cookies and drinks out for Father Christmas? I hope you do, it's hungry work creeping into everyone's house to leave the pressies. My card shows Father Christmas and Rudolf looking at the goodies left on the table for them. Of course I had to include some sugar lumps for Rudolf. Well I couldn't leave him out now could I. I used Paper Boutique Vol 2 Creative Christmas cd for all the elements and backing papers. Good luck! And don't forget our maximum 10 challenge rule and the deadline for entries via the blue frog below is Sunday 5 December. Please also remember to link your actual post and not your blog and no back linking to old posts - these will be disregarded by the Design Team. Week 46 Challenge - Give Thanks & Blog Hop! It's Friday so that can only mean another fab Polkadoodles challenge! And this week is no ordinary week - it's Blog Hop time!! Also, a quick heads up - Nikky will be on Create and Craft TV next Friday 26th November at 8am and she has some brand new lovely products up her sleeve that she will be launching on the show - make sure you watch, record, Sky+ or Internet watch - they're lush! The challenge this week is being hosted by me (Ruth) although the challenge was set by Kris who was announced last week as stepping down from the Design Team due to other commitments, but we've kept with the theme and would like to say a big THANK YOU to Kris to her contribution and support during her term! for her challenge card this week and is giving it to you as a FREE DOWNLOAD for you which is perfect for this week's challenge and you MUST use the download to enter the challenge! You can alter it in any way you wish, but you MUST use the download! If you are stuck for inspiration, just look below at the creations the Design Team have made! The deadline for the challenge is Sunday 28 November at 12noon GMT and please remember to follow the theme and to link with no more than 9 other challenges to be eligible for a prize. Please no backlinking to older projects - only new work will be considered for the top three. Ruth: Quick and simple is the theme for me again this week! I've used flowers printed from Sugar Birdies, curled and layered up to form the head of a flower and I've added a rather large sparkly gem to their centres! The stamping around the edges is made using one of the stamps from the Daisy Doodles stamp plate. I've handwritten the sentiment. Enfys: One of the things in my life that I am most thankful for is the incredible pleasure and joy I get from my little grandchildren. So my cards reflect this and I have made them each a Christmas card using the Paper Boutique Vol 2 - Creative Christmas CD - you will see the other two cards on my blog. Brenda - Two for the price of one! I made the first and was not sure, so did a second and decided I perhaps liked both. The first one uses various elements from the summer section of the new Sundae of Seasons CD and the second on my favourite Fairy Flutterby Gracie, coloured with Aquamarkers, glittered wings and papers from Paper Boutique Vol 1 CD. Emma Hiya, I have used a little birdie, black and white stampie from the Sundae of Seasons CD and backing papers from there too. I think I am most thankful to all those close to me that enrich my life with love, so this card is for them. Tracy: I have made this card to give Thanks to all my followers, who have visited me and given wonderful comments and kept me going when things are low. 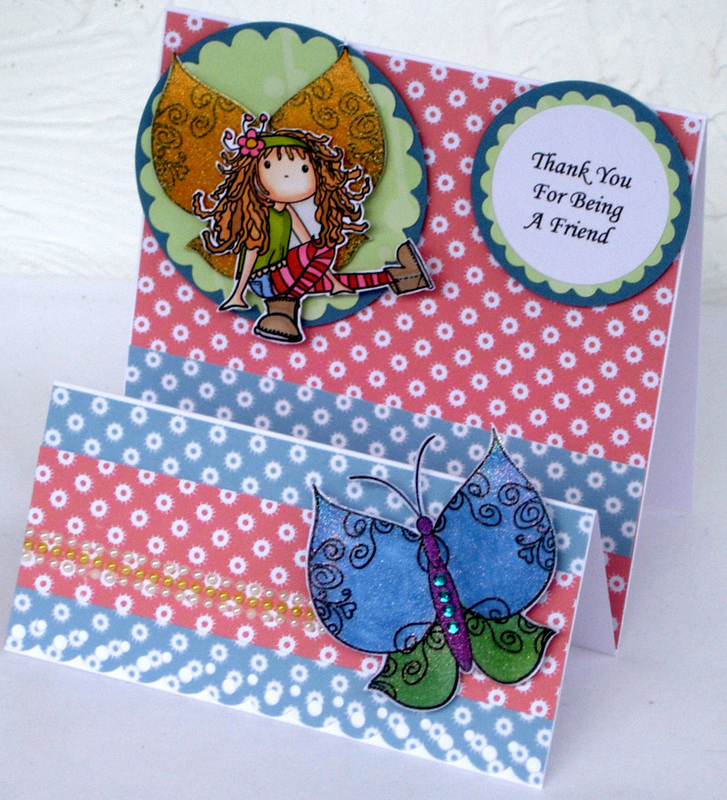 I have used everything from Sundae Of Seasons and the Babsie Flutterfly stamp. Claire﻿ As some may be aware my Dad unexpectedly ended up in hospital. This card was created for the surgeon in charge of my Dads case (my Dad asked me to make it for him) I do indeed have a lot to be thankful for... thanks also to the staff at Ayr Hospital. Created using Sundae of Seasons. Lis-m . One of the biggest things I am grateful for in my life are my two daughters. They have grown into strong and independent young women. They are both very different and yet I can see the closeness in them as they discover the big wide world. I am very proud of them both, and I love them more than they will ever know. I have reached for the Sundae of Seasons cd for my card this time, it is so very useful. Jenny I've decorated a box of chocs with elements from Sundae of Seasons to say 'thanks' to all of YOU! All of the entrants to the challenges each week are fabulous and I wish I could give chocs to all of you, but instead the winner of my blog hop candy will get these in their parcel too! Fliss - I've also made a card to say thanks to all my lovely followers as their kindness really makes my day and cheers me up when I'm a bit down. I've used my favourite Flutterby Fairy stamp, Gracie, and stamped her plus 2 butterflies and embossed them with clear powder. I coloured all the pieces with Promarkers and embossed the fairy wings with jewelled gold powder and the butterfly with crystal sparkle. I've used papers mostly from the Sundae of Seasons CD and made a step card. Pearls and a greeting finish it off. Tracie: Call me old fashioned but I think there is nothing better than a thank you card from children who are given gifts so I am a mean mummy and make both my two write them. This card is to say Thank you for a special pressie. The elements are all from Jingle Jangles (thankyou is cricut cut). Lou: Now I've totally turned the theme upside down as I want to "Give Thanks" and have made a scrapbook page about my family as I am very thankful for them being in my life. I originally made a similar page for Nikky and loved it so much thought I'd recreate it. I'm just waiting for the canvas frame to finished being stretched and it's going to be glued onto the canvas as a piece of art! The boys aren't too happy though but they're not brave enough to take it down either (when it finally goes up!). All the elements and papers are from the "Love and Cherish" CD - one of my all time favs! Deadline for taking part in the hop is Sunday 28 November at 12noon GMT. You must hop to all Design Team members who are listed below and leave a comment on their blogs. Collect a letter from each blog and keep it safe. Once you've visited all DT members, unscramble the word and come back to this blog and leave your answer via the comments section - all comments will be moderated and not published until the deadline has passed so there can be no cheating along the way! By leaving a comment on each DT blog you will be entered into their Blog Candy draw - so don't forget to leave the comments! We hope you have some fun during the hop and keep your eyes peeled for the Candy that is on offer - Nikky has been very very generous plus some of the Design Team have extras on their blogs too - you won't want to miss out on getting your hands on some Polkadoodle products! There is over £400 worth of products on offer - so get commenting and hopping - the more comments you leave the more chances you have of winning! Each team member has a different stash of candy so in theory you could win it all - all 10 lots!! In addition (yes, there IS More, can you believe it??!) you need to read the info on the blogs VERY carefully to read about a fantastic special offer and pickup a special discount code for the Polka Doodles shop - they ship FREE to anywhere in the world!! The order of the hop is as follows, although you can start at any point, just make sure you come back here to leave your comment and answer! Not all of the Design Team are UK based so if their post has not yet published please check back in a short while! Good luck and hope you have lots of fun! Don't forget - for another chance at winning some fab Polkadoodle Candy, make sure you enter the challenge! The response to this time's call was quite simply, overwhelming. And overwhelming not just in the number of you who replied but also overwhelming in talent. We actually had a 6 man tie-break would you believe, so I hope this gives you some idea of the torture we've all been in this week! Before I go any further I have to say a heartfelt thanks to every single one of you who applied and apologise to all of you who didn't quite make it this time. Both I and the rest of the team really appreciate the time and effort you all put into emailing us with your work and if we could have each and every person who applied on the team then believe me we would. This time's call has been particularly difficult to choose from and please please believe me when I say there wasn't a single one that I wouldn't have had on the team had I been able. So if you're unsuccessful this time please put it down more to logistics than the fact your work isn't good enough - we had somewhere in the region of about 50 people who applied I think so you can imagine how difficult the process has been, and we have had to be really ruthless in making our choices. I also intended to email you all individually but as you can imagine it's just been impossible so I apologise that the news has to be broken in such an impersonal way - and if you haven't been successful this time please please don't take it personally and give up, you have to keep getting out there and trying - there is a place on a team somewhere for everyone! The Polka Doodles Design Team is picked by the current Team members in a democratic vote so we can judge who will fit in with what we need for the blog, rather than just being a personal decision by one person. Thankyou so much ladies for joining us, we're all really looking forward to seeing what you design for us as are the bloggers out there, I know - we're so happy to have you all on board with us! phew!! I think I need a rest now - oh no, I can't, so much to do so little time and something about a blog hop? Just a quick hello from me and a reminder to check out the Design Team call - the deadline is Sunday so please see the post below this one to find out what you need to do if you want to enter! We're looking for more than one person so go for it! Also, please make sure you check in with us next Friday for news of the Polka Doodles blog hop - we have over £400 of goodies to give away to lots of lucky people and it's a hop with a difference!! Whoop whoop - so get entering that DT call and the blog hop next week! Sadly we have some news this week that we've lost a couple of our teamies...the lovely Kris has left us for a little while due to some family commitments and the fabulous Brenda has also left us to concentrate on other things - I'm sure you'll see them both around in blogland and we wish them both well and good luck and tally ho! If you are stuck for inspiration, just have a look below at the Design Team creations - gift boxes are not just for Christmas! The deadline for this challenge is Sunday 21 November at 12noon GMT and please remember not to enter your creation into more than 9 other challenges. We are in awe of all the challenges you do link one creation to, but you won't be considered for a top three place. Before we move on, I need to announce the winners of challenge 43 which was Fliss' Autumn theme. Oh, and before I forget - you HAVE to check out the challenge for next Friday - this is going to be one that you DON'T want to miss! The post will go live at 9am GMT as normal, but it will be one that you need to be in on! Lots of opportunities to get your hands on some very wonderful Polkadoodle products as Nikky has already mentioned! Right, on with the Design Team creations for a Gift Box! Ruth: It seems that Fliss and I are on the same wavelength this week! I've made four boxes from the take out box templates on Paper Boutique - Creative Christmas and printed papers from the same cd on the reverse. I know that these boxes don't look finished. It's because they are unfinished! They will be used as little gift boxes when we have our Christmas Day meal. I don't yet know how many I need to make hence the bare look! They will get blinged up and have a little gift inside when the big day comes! Enfys: I covered a little tin box with my favourite gingham paper from Sundae of Seasons and printed out the apple bucket as a black and white stamp, and coloured with Promarkers, then cut it out. The apples were coated with glossy accents. I have put little cinnamon scented candles in the box, but forgot to take a photo of that! Tracy - I have used Meeshelle without her wings from the Fairy Flutterfly stamps, on a Christmas icicle box, which is from the CD Paper Boutique 2 - Creative Christmas . The poinsettia is a stamp from the Crimbo doodles stamp set, and I have used Promarkers to colour the image. Claire - I decided to give the Christmas Pud box a go! 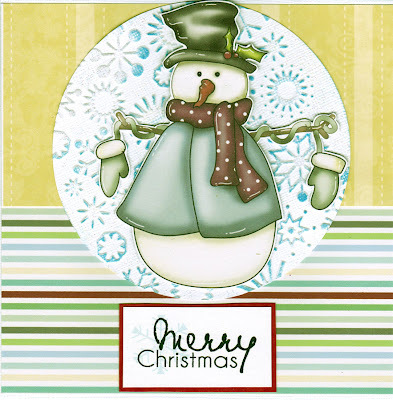 It's from Paper Boutique 2 - Creative Christmas CD. I added some stickles, wire, sakura and a tag in the shape of another pudding from Sundae of Seasons CD. Fliss - I decided to get ahead for Christmas and made a couple of little boxes using a template from the Creative Christmas CD which you can print on the back of some decorated paper. I used some of the pretty festive swirl papers from the Jingle Jangles CD and added embellishments of punched snowflakes with Martha Stewart punched trim and then cut out leftover embellies from my stash of Creative Christmas bits and pieces. These are really fab for small gifts of jewellery, make-up or a few choccies etc. Lis-m - I printed of a couple of sheets of card from the Paper Boutique Creative Christmas cd, using the main blue snowflake paper for the box and an additional layer in the dots. I used a Martha Stewart punch to create a border round the box, added a few gems, layered some nestie snowflakes and a button on top. Of course (who can resist), its Fairy Flutterfly Gracie, coloured in to co-ordinate to give even more cuteness! Emma Hi, I have made a handbag style gift box. Using the printed box template from the Paper Boutique Volume 2 CD - Creative Christmas, I just printed out the box from the CD, stuck it all together, aged it up a little with distress inks and glitter, then I threaded a wire with seed beads through the top for a posh handle and tied chocolate brown satin ribbon in a bow to the front. Finally I added a 'handbag charm' by re-using a part of an old necklace. 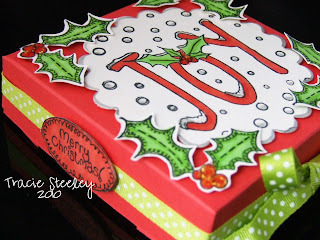 Tracie: I used the Stamp Doodles Joy to make my little Christmas gift box, maybe Santa will fill it with something sparkly and expensive for me? Jenny I've made the milk carton from Paper Boutique Vol 1 and made it into a little Candy Shoppe using the decoupage pieces from Paper Boutique Vol II Creative Christmas. The chimneys double up as fastenings for the box. Dee: I too have made a milk carton box from the Paper Boutique Vol 1 cd. I have avoided Christmas this week and made it as a gift box for a new home pressie. I decorated it with letters from Not for Girls cd and bits of scrap paper that I think are from Back to Nature cd (please forgive me if they're not). The house image is a bit of a tease, and a sneaky peek of something new coming your way very soon, so keep your eyes open. Don't forget - the deadline is Sunday 21 November at 12noon GMT and please remember our 10 challenge rule! Good luck! We are looking for creative talent to join us here at the Polka Doodles challenge blog. You must be able to enter at least 3 weekly blog challenges a month and have a blog. It is part of your duties to leave comments on the challenge entries on a weekly basis. You must be able to contribute fully to the team and be able to commit for at least 6 months. Please make sure you really consider this - many people jump in without really considering the commitment we are asking for and what is required. An important part of your duties is to create samples for Polka Doodles products which will be seen on the website, shows and Create & Craft TV. The deadlines for these samples are very short and are a pre-requisite for the DT members. From time to time you may also be asked to make additional samples as and when required. Payment: there is no payment for this work, but you will receive Polka Doodles products to enable you to make the samples and your projects and obviously these are free for you to keep and use. The Design Team call is open to anyone and everyone, no matter what your ability. We have a diverse pool of creative talents and are looking for individuals who can complement the team. This does not necessarily mean we are only looking for advanced crafters, we have a variety of reasons for choosing new members. If you feel proud of your work then please let us see it. To enter please email Nikky here with a link to your blog and tell us why you want to be on the team. Closing date for entries is Sunday 14th Nov at 6pm. Congratulations to you all! Please email Nikky for further details! I'm looking for speed and style here. I want to see cards that can be made in very few minutes and that can be easily mass-produced but are still stunning designs. Add your card to this post via the blue frog below before Sunday 14th November at 12noon GMT. The design team will be hopping round to see your entry and do remember that we only consider your entry for the top three if you've only entered your card into a maximum of nine other challenges. Good luck! Kris: Here is my quick and simple offering. All of the papers (except for some solid cardstock) are from the Sundae of Seasons CD. I trimmed the image and matted it on papers from the CD - same with the sentiment. I added some punched snowflakes (Marth Stewart) and self-adhesive rhinestone snowflakes. It took about 5-10 minutes to put this card together. You could make batches for Christmas in on time at all! Brenda - I have taken Jenny at her word and gone really quick and simple. A pre coloured candle image, cut it with nesties, made a simple easel card, holly from the same section of the CD and the greeting using a stamp from the Fairy Flutterby sets. Emma Hiya, these are so quick and simple, I just can't believe it they only take about 10 minutes to make. Quite a change for me this time - a little less fuss than my usual style but equally effective. 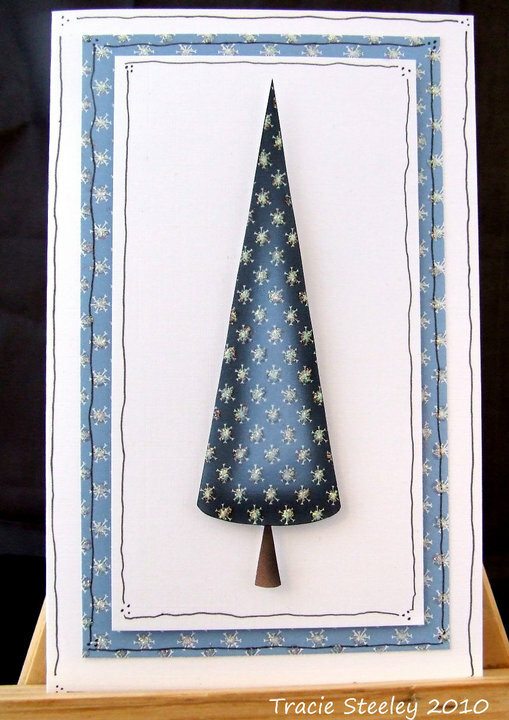 I used Polkadoodles Christmas Doodles rubber stamp plate to create this simple poinsettia Christmas card. Tracy - Everything is from Sundae Of Seasons except the poinsettia's which are from the Crimbo Doodle stamp set. The image is a pre-coloured one from the Disc. And like Jenny requested a quick and simple card. Lis-m This is a tricky one for me as I always like loads of stuff on my cards, but using the Sundaes cd I used the less is more idea. I used brown snowflakes paper, the gingerbread folk and a Christmas border. A little stiching, 3d tape ..done! 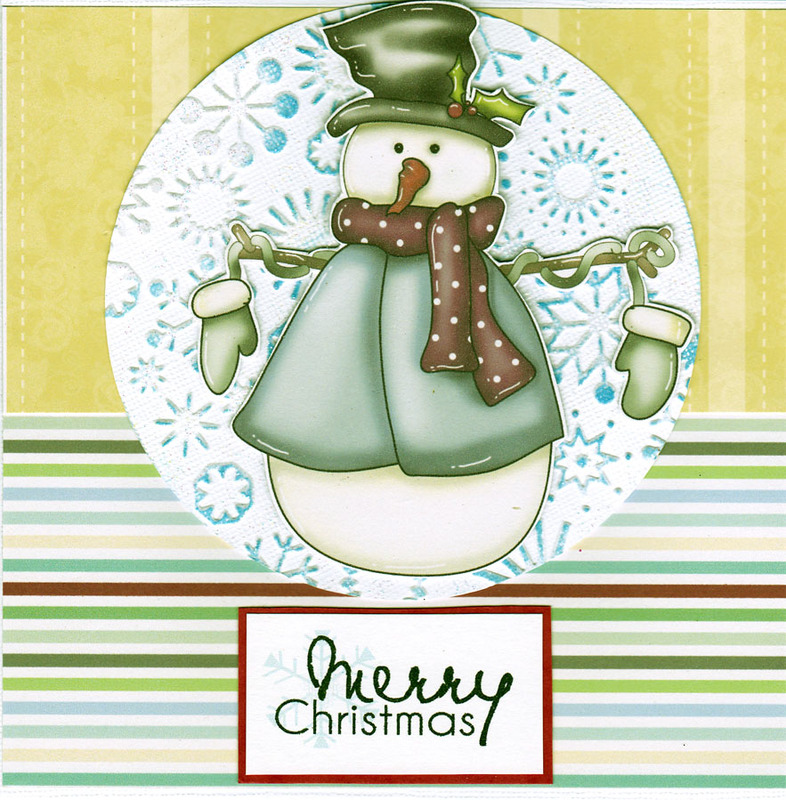 Jenny I've gone for lots of white space and some simple shapes for my card using Sundae of Seasons. I've layered a tree and snowflake onto a circle of snowflake paper. The trees and snowflakes come on sheets of multiple designs so they are ideal for mass-producing. They're also super quick to cut out if you leave a white border. This design can be varied too... for examples see my blog. Dee: I couldn't make my mind up so I made 2 cards. I still can't make my mind up so I'm posting them both, lol. The backing papers are from Jingle Jangles cd and the tree images and other bits are from the Sundae of Seasons cd. A touch of Stickles, Liquid Pearls and some fake stitching and Bobs your Uncle, done and dusted. All the items can be found at Polka Doodles. Claire: A really quick card from me... Based on a pyramid fold with elements from Sundae of Seasons. Just added some Sakura for glitter to details on the cute Reindeer. Ruth: Quick and simple is just how I like it especially when I decide to make more than one! 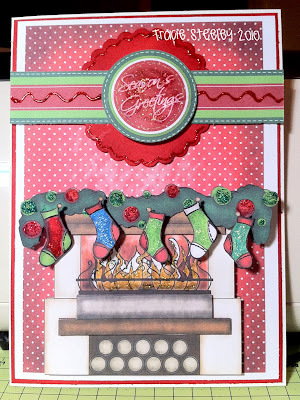 Backing paper and Christmas pud all from Sundae of Seasons. The puds have been added with foam pads so they give a bit of dimension. Just added some berry gems and outlined the ooze of the topping with liquid pearls! Fliss: I decided to make a set with the same layout but different images to show just how easy it is to make several cards at once . I've used images and papers from the Sundae of Seasons CD and added Cuttlebug embossing with the snowflake folder and some sparkle by swishing ink over the embossed snowflakes and embossing with crystal powder. There are 4 cards in total so to see them all, please hop over to my blog for a look. Lisa - I've been MIA here on the PD blog but I'm back this week with a real cutie! The reindeer from the Sundae of Seasons CD in the winter section is just Oh So Cute! I matted him onto some kraft paper and placed him onto a fun polka dot background and added a Merry Christmas sentiment for a simple holiday card! Add a fun bow at the top with a cute red button and VOILA! Simple holiday card! Good luck - you have until Sunday 14 November at 12noon GMT to enter!